The 2018 summer school will take place from September 23rd to 29th. Click on the picture to download the 2018 summerschool flyer. Unfortunately it was not possible to organize the summer school in 2019, hence the next school will be in 2020, as usual in the end of September or beginning of October. LC Lab welcomes you to a week-long summer school with lectures and experiments, forming a comprehensive introduction to the science of liquid crystals. The school is mainly intended for undergraduate and graduate students of physics, chemistry, materials science, engineering or similar directions but also for research staff and technicians new to the field of liquid crystals. We cover the physics and physical properties of liquid crystals (in a way that is understandable for non-physicists), the basic chemistry of liquid crystals (understandable for non-chemists), the preparation and characterization of liquid crystal samples, and we give an overview of the key technical applications. The lecturers are all university researchers with considerable experience of academic teaching on the subject. Importantly, we take the "school" component very seriously, with all lectures being specifically made for the occasion. In contrast to some other thematic schools and tutorials, this one contains no research presentations. We save that for other occasions (and discussions in the breaks, for those interested), whereas the school program consists of true lectures. This reflects the fact that all of us deeply enjoy teaching and the sharing of understanding and appreciation of liquid crystal science (as well as research, of course). Because the practical work at the polarizing microscope is an important part of the course—and we believe this is a truly unique feature of the school—the number of participants is restricted to sixteen. Therefore, early registration is strongly recommended. At the end of every day there is also a session for discussion with all lecturers present, where students can ask questions that appeared during the day. 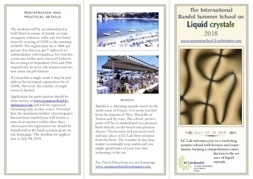 Bandol is a charming seaside resort on the south coast of France. It is easily reached by train, which can be conveniently combined with flights to Nice or Marseille. The school participants will be accommodated in a pleasant hotel directly on the beach, three minutes walking distance from the LC Lab lecture hall, where also the practical work will take place. The weather in late September is normally very pleasant and you might spend some of your free time swimming in the Mediterranean sea.